The title page from A Letter from the Antarctic. J. E. Davis's A Letter from the Antarctic was issued for private circulation in 1901, the events themselves having occurred 60 years before during the second Antarctic voyage of James Clark Ross's expedition of 1839-43. 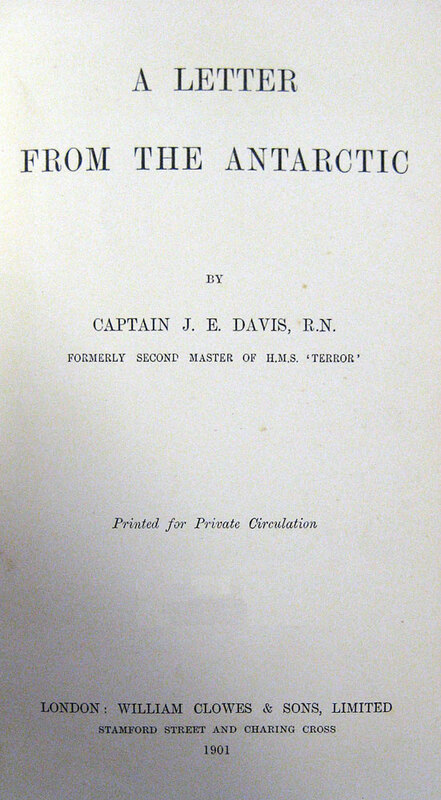 Captain Davis was second master of H.M.S. Terror. The 38-page booklet is in the form of a letter that Davis wrote to his sister, Emily, starting on April 11, 1842, from off Cape Horn. The events described stretch from 23 November 1841 to 2 May 1842. The centerpieces of the letter are the description of a fierce gale on 20 January 1842 that destroyed or heavily damaged the rudders of both the Erebus and the Terror, and the "awful morning of the 13th" [March 1842] when the two ships collided amongst tower icebergs and miraculously escaped complete destruction. John Edward Davis (1815-1877) was a talented artist. 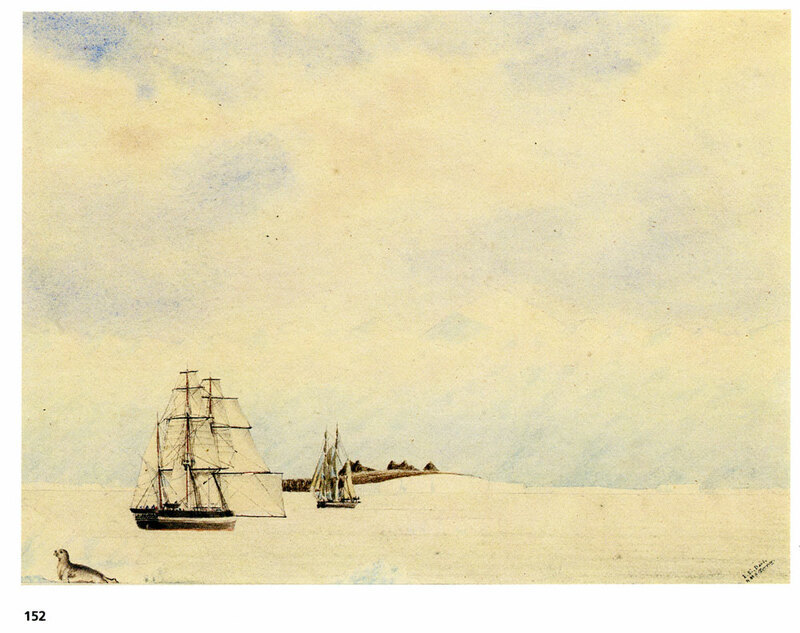 His Letter is illustrated in the text with two ink sketches, a plan showing the position of the ships when they ran on to one another, and a view of the Ice Barrier. 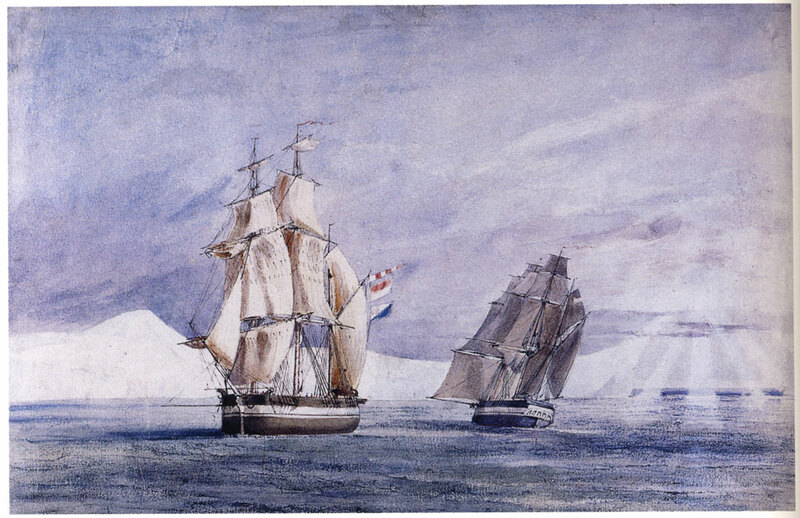 Some of Davis's paintings are in the collection of the Scott Polar Research Institute (versions of which are included in an article by Ann Savours, see below) while others have appeared in recent auction sales. 1. Franklin Island. January 27, 1841. Lat . 76° 8' S. long. 168° 12' E.
2. New Year's Day, 1842. Lat. 6° 32' S. long. 156° 28' W.
3. Possession Island, Victoria Land. January 11, 1842. Lat . 71° 56' S. long. 171° 7' E.
4. Watering in the Pack, 1842. 5. Cape Davis. Lat . 70° 32' S. long. 166° 6' E.
Davis was Second Master on Commander Crozier's Terror and a number of his drawings (the first ever of the Antarctic continent) were used by Ross to illustrate his A Voyage of Discovery and Research in the Southern and Antarctic Regions during the years 1839-43 published in two volumes in London in 1847. James Clark Ross had reached the northern magnetic Pole in 1831 and was charged by the Government, following the recommendation of the British Association for the Advancement of Science and the Royal Society, to lead an expedition to investigate terrestrial magnetism in the southern latitudes. The expedition was the first British exploration of the southern latitudes since Cook's skirting of the Antarctic circle in 1773-4 and the sealer Weddell's furthest south of 74°15'S in 1823. Bellinghausen had probably been the first to sight the Antarctic continent in January 1820 and Dumont d'Urville then discovered Adelie Land and Claire Coast. Their work towards the discovery of an Antarctic landmass was consolidated by James Clark Ross who penetrated the pack ice in January 1841 sailing into the clear water of the uriknown Ross Sea and sighting snow-covered land on 11 January, thereby becoming the first to discover a sea route to the continent. McCormick on the Erebus saw and named an active Volcano (Mt Erebus) and Ross was the first to see and chart the South Polar Barrier which he named Victoria Barrier and which was later named the Ross Ice Barrier. He made two further navigations of the Ross Sea and Weddell Sea before returning to England in 1843. Result: £9,775 including the buyer's premium. This painting was later offered at a Christie's sale (7261) held on 27 September 2006, Lot 154. It did not sell. signed and dated 'J.E. Davis 1842' (lower left), inscribed as titled beneath the subject. black, white and red chalks on brown paper 7-1/4 x 10-1/8in. (18.4 x 25.8cm.) ENGRAVED: by T. Picken in Capt. Sir J.C. Ross, A Voyage of Discovery and Research in the Southern and Antarctic Regions, during the years 1839-43, London, 1847, I, facing p. 169. Davis was Second Master on Commander Crozier's Terror and a number of his drawings (probably the first ever of the Antarctic continent) were used by Ross to illustrate his official account of his voyage published in two volumes in London in 1847. James Clark Ross had reached the northern magnetic Pole in 1831 and was charged by the Government, following the recommendation of the British Association for the Advancement of Science and the Royal Society, to lead an expedition to investigate terrestrial magnetism in the southern latitudes. The expedition was the first British exploration of the southern latitudes since Cook's skirting of the Antarctic circle in 1773-4 and the sealer Weddell's furthest south of 74° 15'S in 1823. Bellinghausen had probably been the first to sight the Antarctic continent in January 1820 and Dumont d'Urville then discovered Adelie Land and Claire Coast. Their work towards the discovery of an Antarctic landmass was consolidated by James Clark Ross who penetrated the pack ice in January 1841 sailing into the clear water of the unknown Ross Sea and sighting snow-covered land on 11 January, thereby becoming the first to discover a sea route to the continent. McCormick on the Erebus saw and named an active volcano (Mt. Erebus) and Ross was the first to see and chart the South Polar Barrier which he named Victoria Barrier and which was later named the Ross Ice Barrier. He made two further navigations of the Ross Sea and Weddell Sea before returning to England in 1843. 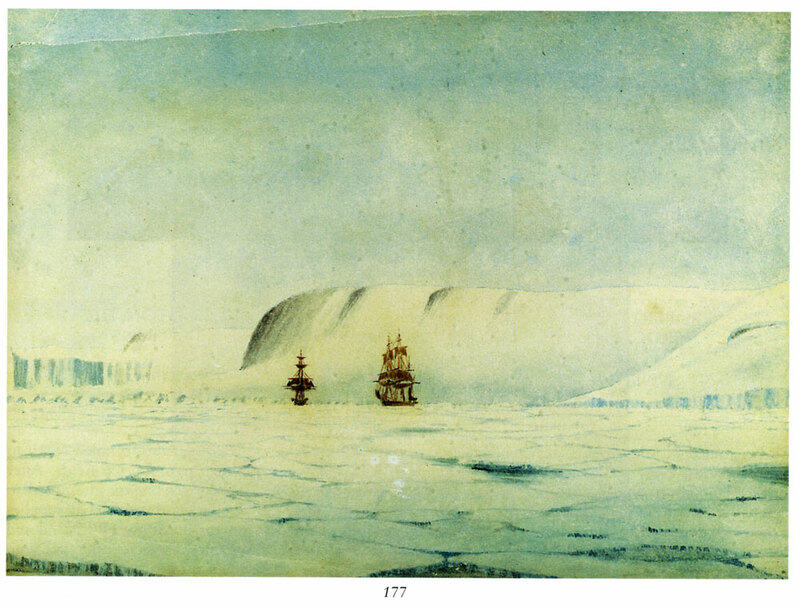 The present drawing by Davis records an incident on their second season in the Ross Sea, when a storm badly damaged both the Erebus and Terror, the latter's rudder being broken to pieces by the ice and having to be replaced by the spare rudder: 'On the morning of the 20th it blew a heavy gale of wind; there we were in the midst of very heavy ice with a very heavy swell on. The ship at times striking hard, it was very difficult to pass clear of the largest pieces which threatened at times to crush us ... we were afraid for our bowsprit, it being so low, but we experienced a greater loss in our rudder which was broken and rendered useless at ten in the forenoon. A tongue of ice got under it and completely ground it round, splitting it all the way up .. ' (Capt. J.E. Davis, R.N., A Letter from the Antarctic, London, 1901, pp. 17-18, with a sketch after the present drawing illustrated p. 20). The Erebus and Terror weathered the storm and on 4 February the ships continued southwards. The ships found greater fame when they were taken by Franklin to the Arctic in 1845 (see lot 143), never to be seen again. 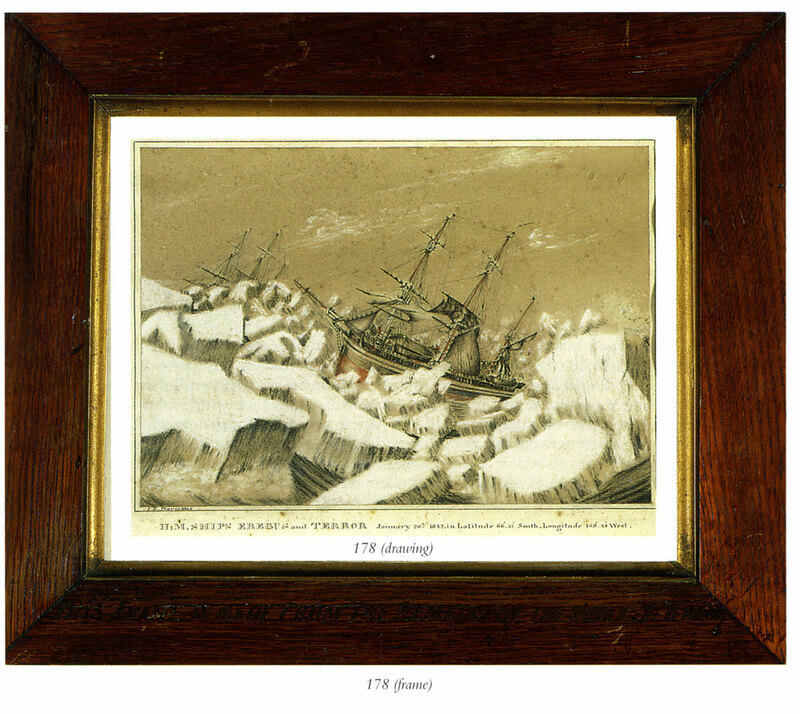 In a frame inscribed 'THIS FRAME IS MADE FROM THE REMAINS OF THE RUDDER OF THE TERROR"
Result: £11,500 including the buyer's premium. This painting was later offered at a Christie's sale (7261) held on 27 September 2006, Lot 155. It sold for £12,000 including the buyer's premium. 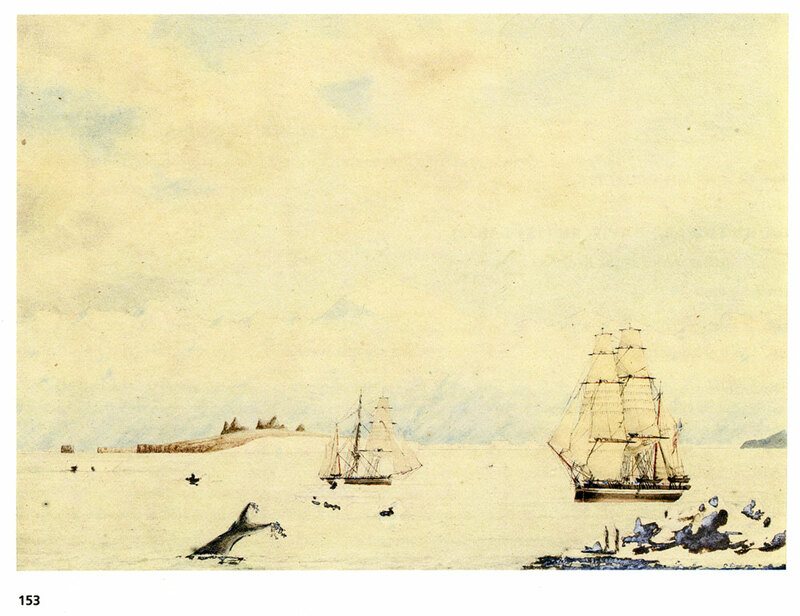 Cape Lockyer, discovered by H.M. Ships Erebus and Terror, January 7th 1843 titled on the original detached label. Davis was Second Master on Commander Crozier's Terror and a number of his drawings (probably the first ever of the Antarctic continent) were used by Ross to illustrate his official account of the voyage published in two volumes in London in 1847. James Clark Ross had reached the northern magnetic Pole in 1831 and was charged by the Government, following the recommendation of the British Association for the Advancement of Science and the Royal Society, to lead an expedition to investigate terrestrial magnetism in the southern latitudes. The expedition was the first British exploration of the southern latitudes since Cook's skirting of the Antarctic circle in 1773-4 and the sealer Weddell's furthest south of 74°15'S in 1823. Bellinghausen had probably been the first to sight the Antarctic continent in January 1820 and Dumont D'Urville then discovered Adelie Land and Claire Coast. Their work towards the discovery of an Antarctic landmass was consolidated by James Clark Ross who penetrated the pack ice in January 1841 sailing into the clear water of the unknown Ross Sea and sighting snow-covered land on 11 January, thereby becoming the first to discover a sea route to the continent. McCormick on the Erebus saw and named an active volcano (Mt. Erebus) and Ross was the first to see and chart the South Polar Barrier which he named Victoria Barrier and which was later named the Ross Ice Barrier. He made two further navigations of the Ross Sea and Wedell Sea before returning to England in 1843. 'Jan. 7. 1843 ... As we advanced to the southward, two high rugged bluff capes at a great distance appeared, bearing w.s.w. (true); the nearest of them I named, at the request of Captain Crozier, after his friend Captain Nicholas Lockyer, R.N.C.B. (Capt. Sir J.C. Ross, A Voyage of Discovery and Research in the southern and Antarctic Regions, during the years 1839-43, London, 1847, II, p.346). For Davis's own account see his A Letter from the Antarctic, London, 1901 (illustrated with own sketches). For further works by Davis on the voyage, see Christie's, 10 April 1997, lot 95 and 17 September, 1998, lot 178. Result: £5,750 including the buyer's premium. Mrs Sabine (Elizabeth Juliana Leeves 1807-1879). The Ross family and by descent to the present owner. Result: £4,800 including the buyer's premium. Mrs Sabine (Elizabeth Juliana Leeves (1807-1879). The Ross family and thence by descent to the present owner. For a pdf copy of A Letter from the Antarctic, click here.